We have confirmed a replacement author for the same date/time/place as our original luncheon with Martha Grimes. Aminatta Forna will join us, presenting her newest novel, Happiness. This EVENTS page will be updated ASAP and an email & mailing will go out immediately thereafter. Please stay tuned! Martha Grimes has suffered an injury and is unable to travel at this time. We are working to finalize the replacement author (for the same date, time & place -- April 25 luncheon at Temple Israel) and we will email everyone as soon as that's official and the new event is open for registration. All who have already registered and paid for Lunch with Martha Grimes will be contacted to confirm their desire to transfer their payment to the new luncheon. 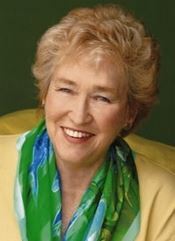 Martha Grimes is a New York Times best-selling author and winner of the Grand Master award from the Mystery Writers of America. Staggeringly prolific, she has penned at least one book a year since her first was published in 1981, when she was 50 years old. She is perhaps best known for her much beloved character, Richard Jury, a Scotland Yard detective who has appeared in two dozen of her novels. Reviewers laud her eccentric British humor and praise her “utterly engaging” prose. 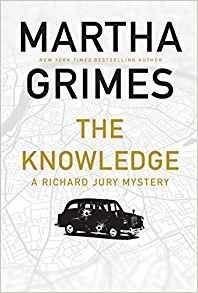 Ms. Grimes’ most recent book is The Knowledge, but we can’t tell you anything about it because…well…it’s still a mystery.